Renewable Solar Energy relies on daylight rather than radiation which generate power through the photovoltaic cells, these cells have two layers of semi-conductors, one positively charged and one negatively charged. When light shines on the semi-conductor the electric field across the junction between these layers causes electricity to flow, generating direct current. The greater the intensity of light, the greater the flow of electricity. A photovoltaic system therefore does not need bright sunlight in order to operate and can generate electricity on cloudy days due to the reflection of sunlight. An inverter is used to convert the DC current into useable AC Current that can be used as power to drive any electrical appliance. Government legislation feed-in tariffs became available in Great Britain from 1st April 2010 and instructed energy suppliers to make regular payments to householders and communities who generated their own electricity from renewable or local carbon sources including Solar electricity. The collectors are simple to install and can be positioned landscape or portrait arranged on-roof, in-roof or flat roof. Electricity requirements will vary and depend on size and energy-efficiency. PV systems will be able to reduce electricity bills as the system will replace some or all of the power obtained from mains electricity. 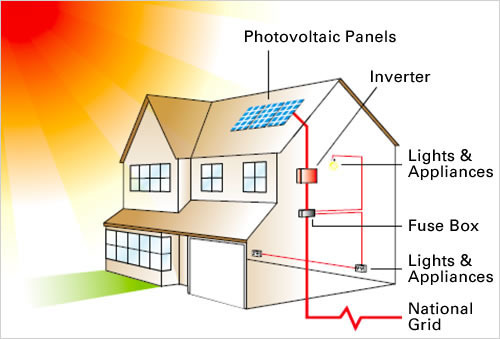 If PV is connected through a grid system it will automatically take electricity from the national grid in times of low generation, for example at night. There is no need to manually switch the system as this will be done instantly. Making it a practical and attractive green alternative product. Awareness of climate change is no longer enough. Individuals and businesses alike are becoming more socially responsible in the search for high quality, effective and sustainable solutions. Solar Photovoltaic meets these needs whilst being simple to install and manage.